They were talking about it again this morning, just like yesterday and the day before: the mid-term elections and the odds of the Democrats losing their congressional majorities. The interviews and discussions are sizable, sometimes filling 20 minutes of airtime, and conducted with such breathless urgency a listener might think the elections are next week. But they aren't. The election is in November, which last time I checked is 8 months from now. That's a heck of a long time to maintain any level of interest, much less the frantic one the media seems to have whipped up for itself. Listening to these stories on NPR makes me angsty ("Oh dear, we're going to swing back to conservative majorities before the progressives have a chance to make any progress.") and angry ("How dare people blame the current status of things on the President and his party? There were 8 years of mismanagement by The Other Guys; you can't clean that up overnight! "), two states I find unhealthy to maintain for very long, never mind eight months. At this rate, I'm going to burn out on the news. And what's sad about this is that the burnout will include all forms of news. I won't just stop listening to the stories and predictions and analysis about the election in November; I'll stop paying attention to events and news locally and globally. To avoid being in a constant state of distress, I'll enter a state of willful ignorance. And I'd bet I'm not the only one. The other result of this myopic journalism is to inflate the importance of these elections, while simultaneously treating them like a sporting event. Not that elections aren't important, but certainly there are equally important things citizens could or should be focussed on. By treating the midterm elections with the urgent blow-by-blow of a natural disaster or an athletic competition, the media encourages people to expect government to move faster, to keep up with the constant pressure for News. If it's not done and over with in a week or two, at most, we can't be bothered to pay attention; we've been trained to rapidly switch our attention from one shiny thing to the next. And none of this is good, for either government or citizen engagement. I always seem to forget how pleasant mornings can be. Clear sky, the sun creeping slowly down the south side of the house and around the garage. Birdsong and crow conversations. The occasional neighbor, with and without dog. The train dinging it's way down MLK. It's peaceful in a way that the afternoons are not. I generally like all the kids running through our neighborhood, and I'm grateful to live in a place where they can get out and play. But sometimes it's nice to have the quiet. Hopefully, Caitlyn will forgive me for not having enough gardening tasks for her in the mornings; she retreats inside, "to warm up my hands," and I rejoice in being able to plant and harvest without chaos and questions, without having to keep one eye out for the thoughtless enthusiasm that results in smashed plants. The pea trellises came out of storage this morning, as did the row cover. I'm really excited about the new row cover supports. I've been looking for something better suited to the task than the grading stakes and string I used last year, but I wanted something that wasn't going to be three feet tall or be permanently attached to a garden bed. I just don't have the space for the industrial strength options I kept finding. Gardeners.com finally had something suited for small, multiuse spaces. And with all the hardware came the seeds. We planted the leftovers of last year's Oregon Trail shelling peas in Caitlyn's garden bed before she went inside. There are Green Arrow shelling peas planted along the pea trellises and a row of non-climbing Cascadia snap peas behind one trellis. 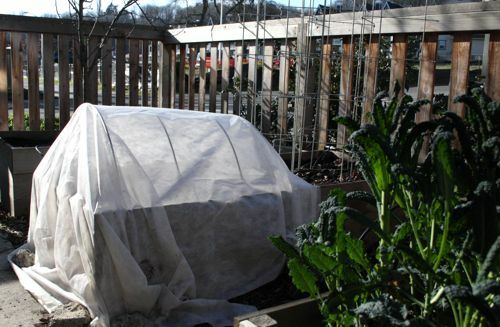 I put three rows of Bloomsdale spinach and a row of mesclun mix under the row cover. With luck, we'll have salad greens in about a month. Until then, we have kale, which is putting on a growth spurt in all this early warmth and sunshine we've getting. It needs to be eaten in less than a month, as it's in the space the potatoes will need in March. Frosting, sprinkles, political engagement - what's not to love? Caitlyn and I joined some friends at Cupcake Royale yesterday for MomsRising's Project Cupcake. 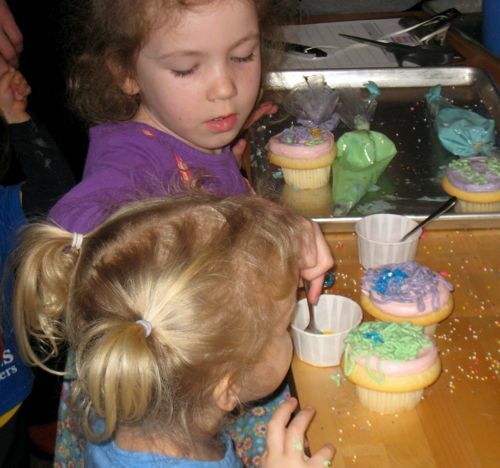 The project: decorate 155 cupcakes for delivery to state legislators in Olympia to remind them that although the kids can't vote, that's no reason for the state government to try to fill the $2.7 billion budget shortfall by cutting the programs kids need. Caitlyn probably decorated close to ten with sprinkles and extra frosting in piping bags; I think I only did two, maybe three. All told, 181 cupcakes went to Olympia today. And Caitlyn managed all this without getting her finger in her mouth or frosting on the bums of strangers while weaving through a crowded space. 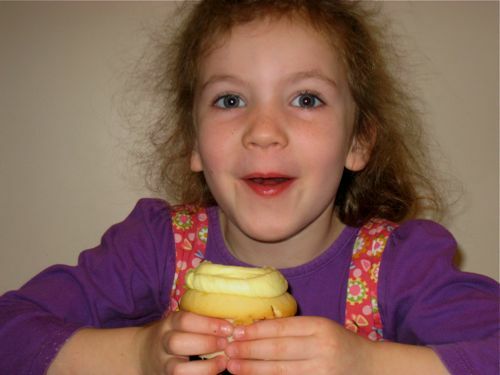 Later, when asked what she did that day, Caitlyn announced, "We made cupcakes for the government! ", so I think even my civics explanations were a success. There was a lemon drop hard candy on the top of Caitlyn's. I made her eat the whole cupcake before she was allowed to eat the candy. Mama's strict like that. We're been having basic civics discussions lately, mostly in context of public vs. private schools. This mostly has involved who pays and how, or How to Explain Taxes to a Preschooler. So, today, Caitlyn asked me, "Is government real?" "Should I find some pictures of the people who work in government for you?" "Yes. Because I'm not sure I believe you." Which seems to me to sum up quite a bit, actually. The visual, easy-to-understand connections between the Taxes I Pay and What Government Does For Me seem to have broken down or disappeared (although I sometimes wonder if they ever existed and it's the Big Picture Informed Rational Human that has disappeared, the extinction of homo rationalis or something). In other words, I'm pretty sure that Caitlyn isn't the only person asking "Is government real?" 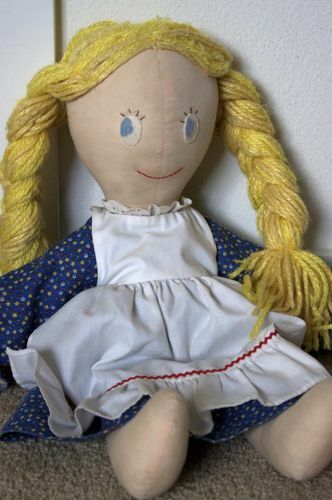 I'm a horrible person because I don't remember who made this doll for me. I think it was my grandmother, Mom's mom, but it might have been my great grandmother. It might have been Mom. I don't remember. I've been told several times and the information just doesn't stick. 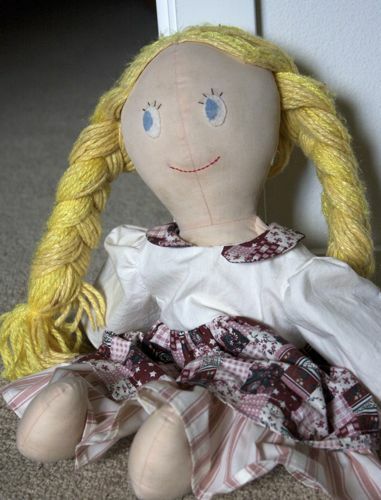 I do remember playing with this doll a lot. I liked to braid and rebraid her hair. She's stained on one hand, probably from being taken outside too much, or being held by my own grubby hand. Disturbingly, I never named her. She has always been The Ragdoll. She's Caitlyn's now. And I've made her a new dress. I may have gotten a little carried away and made it too long. 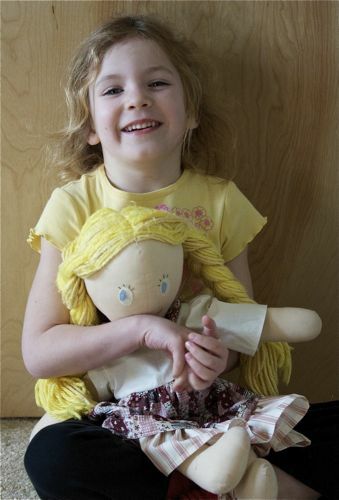 And the pattern is for a "conventional" doll, so it doesn't fit right. This is the last time I make that collar; it won't lie flat and the facing is always sticking out. I figure if I make a few more outfits, I'll get the bodice adjusted properly. Caitlyn certainly wants more clothes for her "baby". There's been a flurry (accidental weather pun) of hype about the Olympics getting started yesterday in Vancouver. The news has been full of worried reports about our unusually warm January and the measures the hosts are going to to keep the snow on the mountains long enough for the Games to happen. We don't watch TV, broadcast or cable, and we're really not sports fans, so it's mostly been a thing happened Out There. And so, it took me a moment to recognize the subject of this project at Craft's blog. Then, after I realized this was an Olympic Something I was looking at, I looked again. Hmmm, those creatures look familiar. So, I checked, and hot spit! We know the folks who designed the mascots for the Vancouver Winter Olympics! Not only is Caitlyn collecting their books, but they did graphics for one of Ian's music videos. Kinda makes me all giggly inside. Of course, now that the whole thing has actually made it to my radar, I need to decide if we're going to share any of the Olympic Madness with Caitlyn this year. Growing up, the family television had a tendency to disappear when it wasn't Olympic Time, so that automatically made the Olympics something special. I also remember liking the medal ceremonies, who knows why. I got to watch the Torch go by in 1984, when the Summer Olympics were in Los Angeles (I think I climbed a tree to see it), which was also the year the third grade classes at my elementary school held a Third Grade Olympics in conjunction with the Current Events unit about the Games in Sarajevo. Maybe I'll look for the highlights on YouTube. But I think I'll wait a while before trying to explain the whole thing - international competition and the layers of issues (legitimate and otherwise) and all. Maybe 2014. We stopped by the p-patch on the way home from school this afternoon and discovered that the garlic planted last fall is doing swimmingly. I used some maple leaves in the fall as a mulch, and the garlic now is growing through the leaves. Not just pushing the leaves aside and growing up between them, although there's plenty of that going on. No, this is garlic greens literally poking holes through the maple leaves and then pushing through and up, so the maple leaf is actually suspended several inches off the ground. I'm sorry I didn't have a camera with me - and that it didn't occur to me til just now - or I would post a picture. There's also some kale chugging along out there, and a thin population of fava beans which will need to be cut down and turned under soon. I'm afraid my cover crop ambitions didn't turn out so well. I'm not sure if I should blame the fall weather or myself for not getting the seeds sown in a timely fashion. No, it's probably my fault, since I waited for the summer crops to be done before sowing the fava beans, thus shortchanging them on a couple weeks of growing time before the weather did whatever it did (I don't really remember what it did in November). I like the idea of cover crops, but I think I'm probably working in too small a space to really do succession planting right. I was surprised to find two clusters of pansies that are doing really well, blooming even. 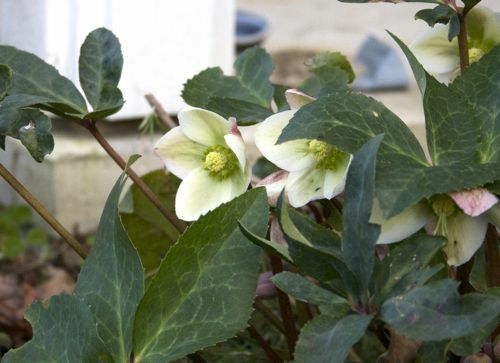 I may dig them up and move them to the backyard since the space around my clematis is bare. 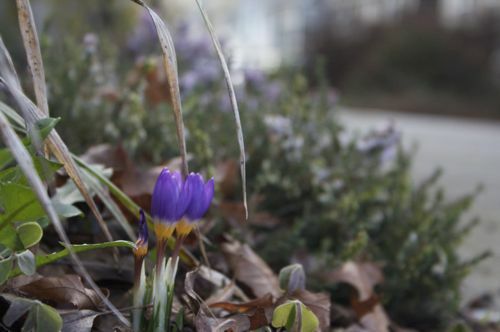 As we came to the house, Caitlyn noticed the crocus in the front yard starting to bloom. She's so excited about spring and summer that she's started breaking out last summer's wardrobe. Nothing fits, of course, which means it goes nicely (she thinks) underneath her winter clothes. I keep having to tell her to take the shorts off before she puts the tights on. I should feel guilty about this. But I don't, surprisingly enough. Caitlyn and I skipped school today. Sure, she's been coughing all week and has a sniffle in her nose. And yesterday, two of her teachers commented on it, one to me, one to her. Today she told me that one of her teachers said, "You sound sick. I'm going to stay over here, away from you." So, we had a reason. But Caitlyn's not feverish, and she's gone to school with a cough before. No, the big reason we didn't go to school today: I didn't want to. I didn't want to deal with the train/bus routes and the nearly hour-long commute there and back again. I didn't want to drive 20 minutes. I didn't want to sit in Tully's for two and one-half hours. I didn't want to pack lunch. I just didn't want to do any of it today. If we were going to play hooky, I suppose we could have done something significant with our day off. But we didn't do that, either. Caitlyn rested and played quietly in her room. We read a bunch of books. We made it to the library to pick up our holds and to the Post Office to send our OLPC to Haiti. Caitlyn broke a needle (plastic) working with foam beads (I don't know how) and did some puzzles and practiced some letters. I got about as much work done at home as I would have at Tully's. But the benefit: I'm not a basketcase tonight. And that seems worth it. Caitlyn and I walked from school to the Westlake Link station yesterday afternoon. 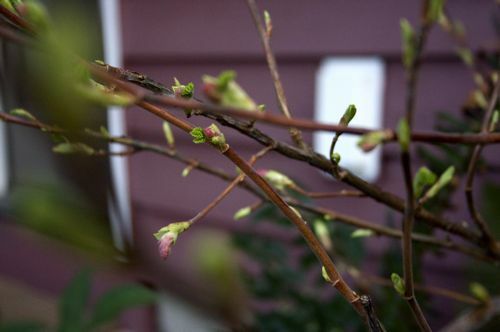 We found cherry trees starting to bloom (one totally covered in buds so that it looked pink from a block away) and daffodils pushing their greens up. Caitlyn nearly burst with joy when we found a camillia in bloom; she's been waiting to pick up faded camillia flowers for a full year now. In completely unrelated news, I have found a way to make fruit muffins palatable to Caitlyn, I think. She's objected to peach, strawberry or blueberry muffins in the past, something that made no sense to me since all those muffin varieties are sweet. She loves the fruit straight, and she eats carrot muffins, so what's the problem?